We’ve developed a number of effective treatments for periodontal (gum) disease. Depending on how far and deep a patient’s infection has advanced, treatment can be quite invasive and even require surgery. The more invasive, the longer and more uncomfortable the healing process can be. But using a medical laser could make that less so. 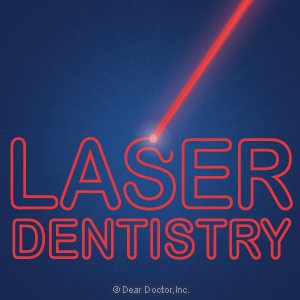 Although its use for gum disease treatment is still in its infancy, the latest observations from the field seem to show patients undergoing laser treatment may have less tissue trauma and bleeding, less discomfort after the procedure and quicker healing times. Gum disease is a bacterial infection mostly caused by dental plaque, a thin film of food particles that build up on teeth in the absence of effective oral hygiene. The infection can advance deep below the gum line, weakening gum attachment to teeth and destroying supporting bone. Ultimately the affected teeth can be lost. Traditionally, the only way to stop the disease is to manually remove plaque buildup on teeth and gum surfaces, which is continuing to sustain the infection, with special hand instruments called scalers or ultrasonic equipment. Because it’s important to remove as much plaque and diseased tissue as possible, we may need to perform a surgical procedure called flap surgery to move some of the gum tissues out of the way to get to these deeper areas. As with any surgery, this can create tissue trauma that may cause discomfort during the healing process. Our new alternative is to use an Nd:YAG medical laser in a procedure known as Laser Assisted New Attachment Procedure or LANAP. With light energy delivered through a small fiber no more than the width of three human hairs, the laser can pinpoint diseased tissue and destroy bacteria through intense heat. Because of the laser beam’s tiny width and pulsing action, healthy tissue is at less risk for trauma than with the traditional treatment. Coupled with other techniques, LANAP procedures could remove as much infected tissue and plaque as traditional methods, but with less healthy tissue trauma. In the future, then, patients with advanced gum disease undergoing laser treatment could have less bleeding and discomfort and faster healing times.